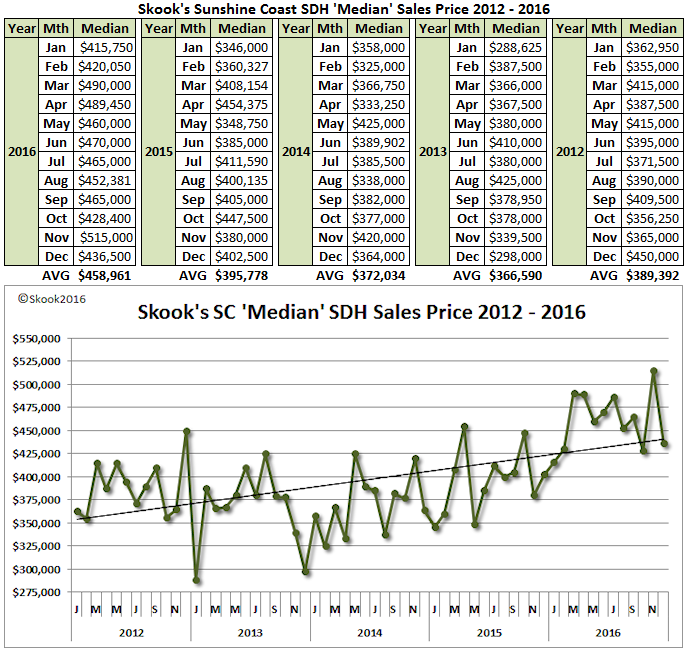 Skook: combines SDH sales under $1 million dollars + MOP sales; reports $1 million dollar sales separately. The table and chart below shows an important aspect of their reporting method - the number of sales used in their medium (MSP) and average (ASP) sales price calculation varies. 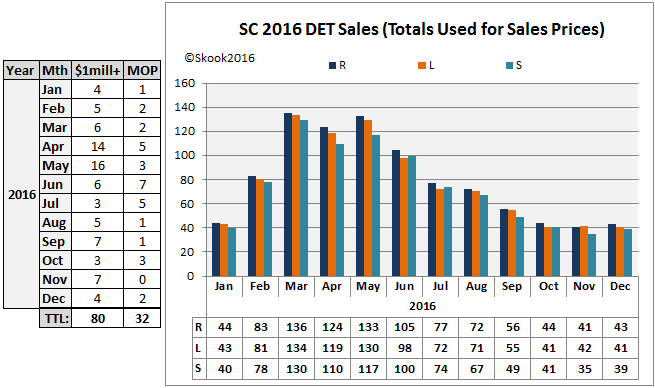 To illustrate: in May 2016, the table on the left shows there were 16 sales ‘$1million’ and above and 3 manufactured on pad (MOP) sales. The REBGV (R) calculated the MSP and ASP using 133 single detached home sales which include sales above and below $1 million dollars and manufactured on pad (MOP). SC Realtor® Gary Little (L) calculated using 130 sales because he reports MOP sales separately. Now, if you’ve followed my postings in the past at VancouverPeak.com, you know that I’ve long felt including ‘$1million+’ sales distorted the Sunshine Coast MSP & ASP (this will soon become moot if prices continue to rise); therefore, I (S) reported ‘$1million’ and above sales separately but included MOP sales in my single detached calculations. The total sales used: 117. The chart above illustrates what I have explained above. 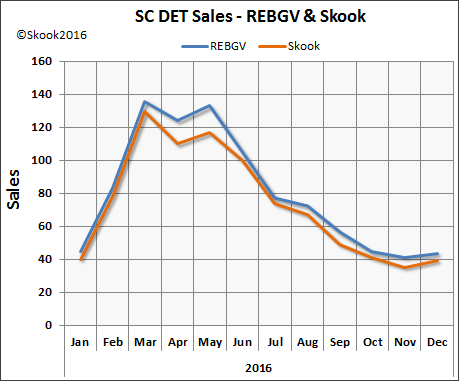 We can see that in May 2016 the REBGV used 133 sales to calculate the MSP & ASP; Little used 130 sales; and, I used 117 sales. The chart below illustrates the difference between the REBGV and me in 2016 in the number of sales used in our MSP & ASP calculations. The point of this exercise was to show that not all sales stats are created equal. This doesn’t make them wrong - just different and you need to know how and why they’re different; unfortunately, this is often a difficult task when tables and charts are poorly labelled; or, no explanation is provided. High to Low? My inclination is low to high; and, I’m getting the same result. What is critical for the MSP is the number of home sales used in the calculation. 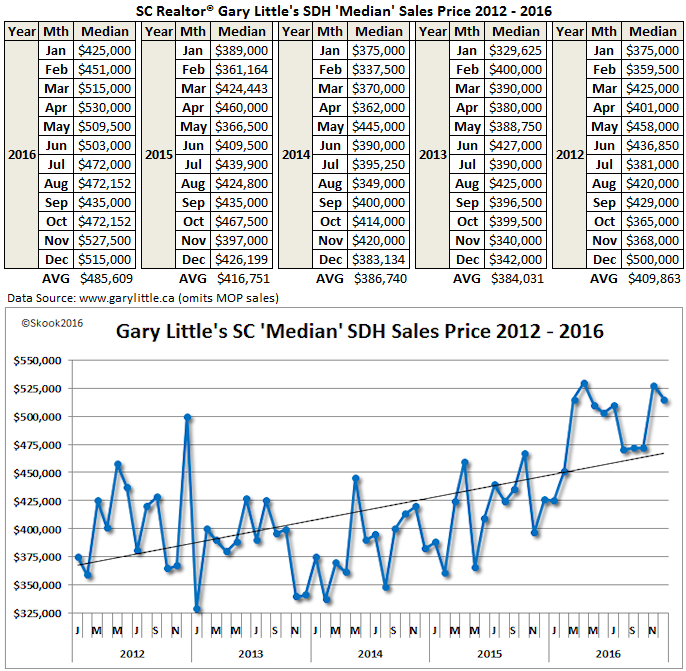 In April 2016, SC Realtor® Gary Little reported a MSP of $530,000 using 119 sales in his calculation. He included 14 ‘$1mill+’ sales but separated out 5 MOP sales. By comparison, I had a MSP of $489,450 based on 110 sales (kept the 5 MOP sales but separated out the 14 ‘$1mill+’ sales). The difference of $40,550 is not a great deal when you consider the high end sales ranged from $1,051,000 to $1,950,000 (the MOP sales ranged from $45,000 to $123,000). But, as I mentioned in the past, in a “normal” behaving market that difference might be important when deciding a list price or submitting an offer. By the way, the REBGV reported a MSP of $517,500 using 124 sales in its calculation - the inclusion of those 5 MOP lowered the Median Sales Price by $12,500 compared to Little’s sales figure. The difference between the REBGV and my MSP is $28,050. The next table and chart lists show the MSP reported by Little each month on his real estate statistics webpage. I calculated a yearly average of the Median Sales Price and Little shows 2016 up 16.5% compared to 2015 and 25.6% compared to 2014. Little’s steeper upward trend in 2016 is due to the significant increase in ‘$1mill+’ sales: 180 in 2016 versus 36 in 2015 - a sales increase of 122%. Little’s inclusion of those sales meant I needed to set the vertical axis at $325,000 to $550,000. My MSP calculation is below. The yearly MSP average shows 2016 rose 16.0% versus 2015 and 23.4% versus 2014 - slightly less than Little but not significantly so. Where you can see the impact of my removal of ‘$1 mill+’ sales is in the chart: mine shows a less dramatic rise which I believe is a more realistic picture of the sales price for the average family home sold on the SC. The MLS® HPI reports the price for an ‘economic bundle’ of housing features of a ‘typical’ house for a neighbourhood, area or region. Modelled on the Consumer Price Index or CPI, it is considered to be the most accurate indicator of housing prices trends in a given region. Below I table and chart the HPI and BSP and they show a significant rise bordering on parabolic. The consensus in the industry is that parabolic rises indicate a bubble (google “parabolic house price”). 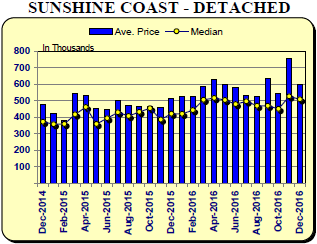 The Sunshine Coast BSP ended 2016 at $492,900 - up 14.8% from the beginning of the year. Over two years (Jan 2015 to Dec 2016), the BSP rose 40.5%. By Dec 2016 the BSP had risen 48.2% from its May 2013 low of $332,500. 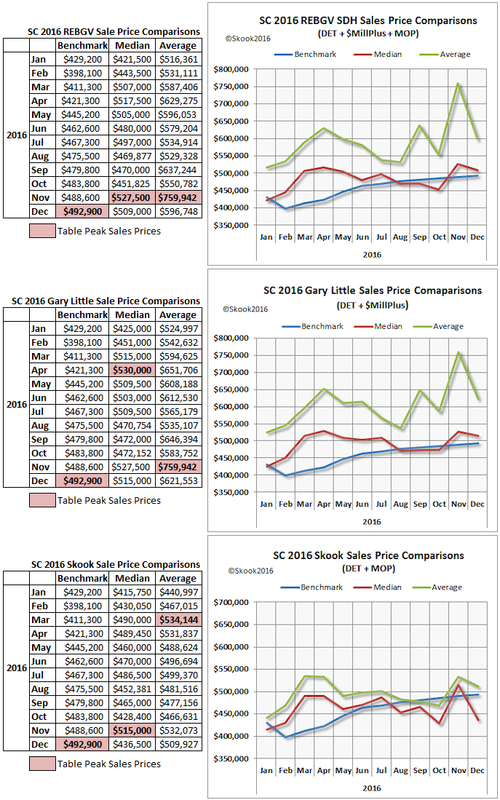 I have tabled and charted the Benchmark, Median and Average Sales Prices for the REBGV, SC Realtor® Gary Little, and myself. The Average Sales Price is based on my own calculations and for the REBGV and Little it may not be exact but it is in the ball park when you compare them to the REBGV’s own MSP & ASP chart that follows. I have indicated the peak for all three sales prices in each table. It’s interesting to see how they differ based on what sales they choose to include in their calculations (explained above). As I’ve mentioned before, including $1million plus property sales has a huge impact when you compare my table and chart to the Board’s and Little’s. The average price is calculated by dividing the total dollar volume of sales by the number of sales. The average price is the simplest to explain but is not always the most accurate since it may be skewed by the mix of properties, such as more high-end or low-end sales will skew the number up or down. In a list of housing prices from high to low, the median is the middle price.